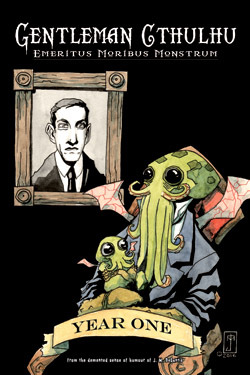 As with Chadhiyana #0 (which I self-published in 2012), Gentleman Cthulhu: Year One is available in both digital and print formats on IndyPlanet. Though originally my thought was to collect only the first year until a significant collection could be made (that is, enough comics to fill a square-bound trade), I’m planning now to release a collection every year. So, if you really love the web-comic, you’ll have these comics every year to look forward to and collect. Of course, for those who wish to continue to read them online, all of the comics will remain free on the website for your enjoyment. Plans are in the works (and action too) to get the book on DriveThru Comics and comiXology (and thus Amazon Kindle) as well. Though as I haven’t personally used their services before, it may take me a little bit of time to set things up (most publishers and distributors have their individual requirements for setting up and delivering files). I’ll make announcements if and when they are available. I hope you picked up a copy of Chadhiyana #5 (as I wrote last week, it’s a great issue, and I’m very proud of it), and will take a look at Gentleman Cthulhu: Year One as well. Happy reading. Cheers!